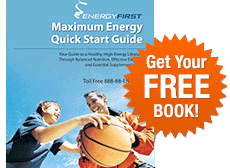 Are you an EnergyFirst success story? My friend has been using EnergyFirst products for about four years. Her enthusiasm for the products sparked my interest. I decided to try the EnergyFirst Greenergy. I am so happy I did! I used to get sick all the time. My friend recommended that I drink at least one glass a day when I started to feel I was getting sick and, then, to drink a few more glasses a day. Drinking Greenergy helped me feel better and avoid getting sick. Now, I drink Greenergy every morning. Since I started drinking Greenergy six months ago, I feel much more energized and healthier than ever before. A few of my co-workers noticed that I wasn't catching the sicknesses that circulated our office and were amazed. They asked me what I was doing to stay healthy and sick-free. I told them about Greenergy and now they are drinking Greenergy too! I have a feeling our office will be the healthiest and most energized office out there. The best result I have had since I started drinking Greenergy is that I have the energy to work-out every day before work. I am able to get right up in the morning, whereas before I would stay in bed and sleep through my planned workout time. Now, I wake up at 5am sharp, drink my Greenergy, and head off to the gym. My days are more productive, I go to work clear headed, and have much more energy throughout the day. I started bringing Greenergy to work and have another glass of Greenergy in the afternoon. I used to drink at least one latte a day, sometimes two a day...now I don't even crave coffee. It is truly an amazing product!